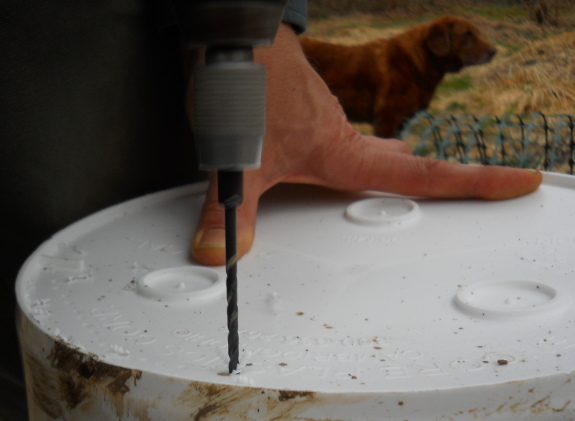 Drilling holes in a bucket from the outside presented a problem. Sanding them off while reaching into the 5 gallon bucket honey strainer is awkward. I wished I had tried to drill the holes from the inside now, it may have made the clean up process easier. A countersink drill bit should make light work of it. It you don't have one of those, a drill bit larger than the one used to make the holes should work as well. Use a light touch, or the drill will bite into the plastic. Good idea! I felt like there was some mechanize solution, but Mark just struggled away with sandpaper and eventually got those burrs off. Wow, hanging chads... brings back bad memories of 2000! Does a plastic hanging chad count as a vote for Gore or Bush? A guy by the name of Eric Blumrich made a very clever and informative Flash video on all the dirty tricks that were deployed to allow George jr to steal that election in Florida, although some could argue Mr Gore lost on purpose for some unknown reason by looking at how he ran the campaign. I tried searching for this video to link to it, but it would seem it has been scrubbed from the internet. There are a couple of links, but they don't work and the home site for Eric Blumrich seems to have been stolen by someone who is not Eric. Not even on Youtube or Google videos? Does anyone know what happened to this Masterpiece of history? The title was "Grand Theft America" by Eric Blumrich.